It’s unlikely they will ever truly replace good old reliable potatoes, but sweet potatoes have really hit main stream. Everyone is getting on board, trying to give them a chance, and I couldn’t be happier. From French fries to pancakes, they are everywhere. There’s no question, a nutrient-rich baked sweet potato is incredibly filling and satisfying in a pinch. I’m known to pop one in the microwave for a fast meal and top it with whatever is loose in the fridge, from chutney to chili. Of late, one of my favorite ways to prepare sweet potatoes is in latkes. Add a little onion, some binder, and they are worthy of a place at either the breakfast or dinner table. In mini portions, they make a handsome appetizer with a dab of sour cream and chives. Unlike potatoes that turn color when prepped ahead, sweet potatoes grated a day in advance will still hold beautifully. 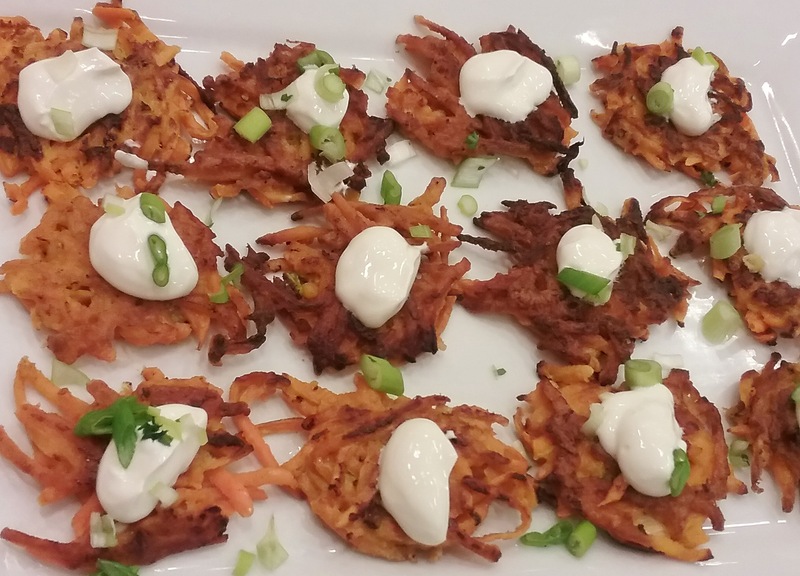 With the holidays headed our way, consider latkes as part of your party entertainment fare. Inspired by Gale Gand’s Brunch! 1. Grate the onion with a box grater into a mesh strainer and squeeze out as much liquid as possible. 2. Either grate the potatoes on a box grater or use a food processor. 3. In a large bowl, mix together the sweet potatoes, onion, flour and eggs until well combined. Season generously with salt and black pepper. Make little balls and flatten them into about a 3 inch disc. 4. Pour about 1/4 cup oil into a skillet and heat over medium high heat. Put a few latkes in a pan at a time, press down firmly with a spatula, and fry for 3-4 minutes on each side until golden brown. Move to paper toweling to drain and hold in a warm oven. 5. Top each with a small dollop of sour cream and sprinkle with chives. Makes 8 large or about 36 mini-latkes. Previous: Previous post: What Sounds Good? Next: Next post: Behind the Curve?